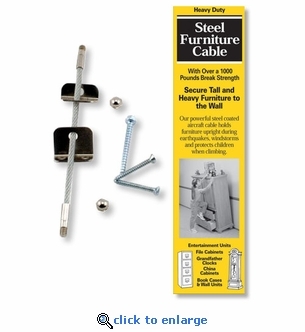 This 4" steel cable strap can be used to secure tall and heavy furniture to the wall. Keeps furniture upright and secure during earthquakes, wind storms and protects children from toppling heavy furniture. Some items may require more than one strap. Easy installation. Requires hardware screw mount to both furniture and wall. Disconnects in seconds for cleaning. Use on any top-heavy furniture, file cabinets, grandfather clocks, armoires, display cabinets, book shelves and more. Includes steel cable strap, hardware and mounting screws.